All the processing in the world won’t solve your problems if bad placement creates a system with inherent sonic errors. A clean elevation of loudspeakers to attain improved mid/high-frequency coverage. Some worship music mixes are a real breeze – there’s no feedback, the instruments and vocals are well balanced, and the levels are comfortable for the congregation from front to back. But other times, it can be an audio nightmare – the loudspeakers are belching pure feedback, the folks up front are sustaining permanent ear damage while those in back only hear only mud, the minister and/or music director are not pleased, and you’re in the hot seat. These strikingly different scenarios can occur in the same church with exactly the same audio gear. What’s the difference? In the first instance, there is adherence to the basic best principles of loudspeaker placement, while in the second, there is not. The bottom line: violate those elementary rules and no sound system will perform optimally. Most churches were never designed for the acoustic onslaught of modern Contemporary Christian music with big drums, big stage amps, and big stage monitor levels. Start with some hard walls, a linoleum or concrete floor, and a reflective ceiling, add a teen worship band blasting away in the corner, and it’s a recipe for audio mayhem. Church leadership typically doesn’t like to spend a lot of time or money on acoustic enhancements, particularly in a 100-year-old church. 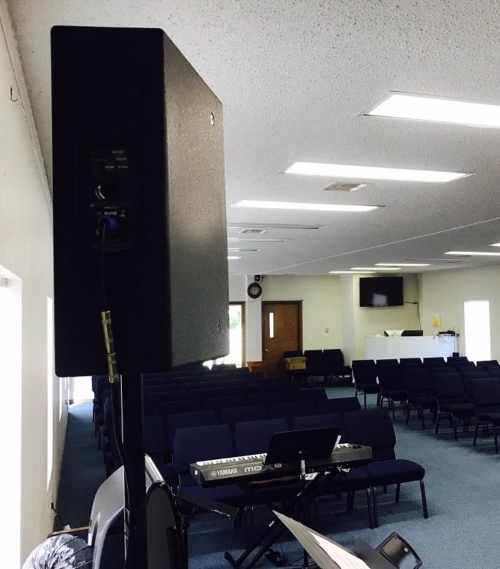 They might approve of an 18-inch-high riser for the praise team with a few dedicated 20-amp AC circuits, but beyond that, we’re often on our own. Another nice view of an elevated loudspeaker and the coverage it will deliver. The more we understand about how sound reinforcement systems work, the better our audio quality will be. And the main point is that all of the advanced signal processors, compressors, and limiters in the world won’t help if loudspeaker placement errors lead to a system with inherent sonic errors. Here are a few simple loudspeaker (and microphone) placement rules that can transform a potentially horrible experience into an uplifting worship service. 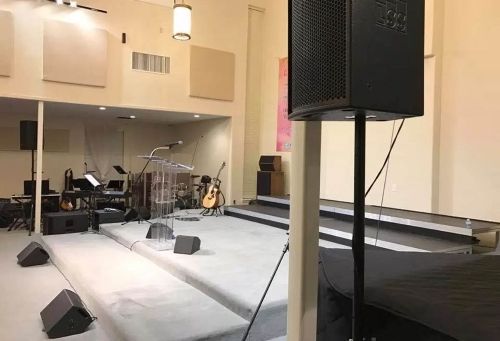 I can’t count the number of times I’ve seen smaller PA loudspeakers placed on the stage/platform floor, effectively putting their horns at waist level for much of the congregation. While bass frequencies behave a lot like water, flowing around most obstacles, the midrange and high frequencies emanating from these horns act more like light beams – objects in their path interrupt and absorb them. When loudspeakers are placed down low, the people sitting in the front rows not only get an earful of mid/high frequencies but they also absorb and disperse them. Meanwhile, listeners in the back hear lows without the midrange presence and high-frequency sizzle that make vocals stand out. What to do? Elevate! When possible, the cleanest way to do this is to suspend the loudspeakers, with the caveat that proper and legal safety practices must be followed at all times. In a lot of cases, though, all that’s needed are loudspeaker stands. Many loudspeaker cabinets include an integral stand socket to facilitate stand mounting, thereby raising those all-important horns above the crowd. I like to place loudspeakers as high as reasonably possible, with the horns at least 7 to 8 feet above floor level. This has two desirable effects: it leaves high-frequency sounds unblocked, and it beams less sound directly at the congregation up front. So there’s less volume in the front of the room where it’s not needed, and more in the back of the room where it makes a critical difference.